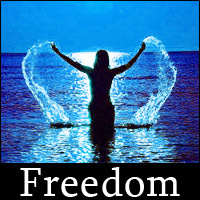 Freedom is one of the most important aspects of life. To think, to learn, to question, to act, and to implement and build, without interference from arbitrary third-party controls, are some of the fundamental basics of freedom. A secular society has a greater potential for its members to enjoy more freedom because they are less likely to be restricted in thinking and expressing themselves. In a secular soceity, education can also function more effectively. The price of freedom is responsibility because if we abuse this natural right, we risk losing it. For example, we may enjoy the freedom of consuming a natural resource, but if we exhaust its supply it could become unavailable either temporarily or permanently; to be responsible may, for example, require the implementation of self-imposed limits on the quantities consumed. This is where freedom can appear confusing to people, since a government authority is often needed to protect our freedoms by implementing regulations, and is why other values such as honour and education play an important role in a truly free yet healthy and functional society.